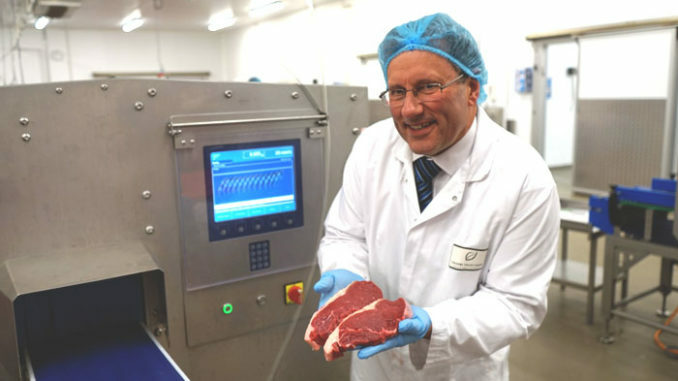 Country Valley Foods is aiming to meet the high demand for its fresh meat products by investing in a state-of-the-art steak-cutting machine to increase productivity. The food service supplier, which recently expanded into its large factory premises in Billingham, is investing £140,000 in the equipment thanks to a successful period of growth over the past two years. The Marelec Portio is an ‘intelligent portion cutter’ which uses three internal cameras to measure the size, weight and density of the meat using digital scanning, then slices it into accurate portions using a fast-moving blade. The portion control is currently managed by five butchers, however the introduction of the Marelec Portio will allow Country Valley Foods to focus their skills elsewhere on more complex meat preparation tasks. Using the new machine will also increase the number of accurately cut steaks the firm can produce, as it can cut a perfectly portioned whole sirloin in approximately five seconds. Due to the accuracy of the technology, it also eliminates human error. Managing director James Munro said: “During the past few years, we have taken on many new customers, and seen an increased demand for our fresh, dried, frozen and ambient goods. “This growth has allowed us to invest in this fantastic piece of equipment which will allow us to increase productivity. We currently produce approximately 14,000 steaks per week, but using the Marelec Portio we hope to produce 30 to 40 thousand steaks a week.